The new designed Coloromat 100 allows easy measurement of transmission, extinction and colour units at the recommended wavelengths in the range between 340 and 900 nm. The touch screen is used for soft key functions and alphanumerical inputs which allows easy handling for example batch name, user etc.. The wavelengths are selected via the touch screen. Three wavelengths are pre-installed as standards, optional the Coloromat 100 can be equipped with six further customized wavelengths. This opens a wide range of applications. Due to the generous dimensions of the sample chamber the use of polarimeter flow through tubes up to 100 mm as standard cuvettes allows easy filling and a high through-put. The sample compartment is open to the top and the bottom avoiding spillage to enter the unit. Due to its unique optical design the Coloromat 100 is not affected by stray light. 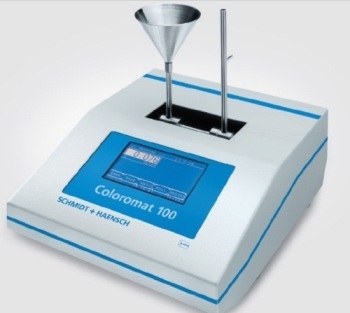 The Coloromat 100 is equipped with a continuous measuring mode with free configurable sampling rate for monitoring color changes in product streams as a function of time.